<< Mormons Are Sooooooo Queer! Ha! Before I got married we lived together for 4 years. I always referred to his parents as my sin-laws! It’s almost as good as leaving out the comma in the following sentence: It is time to eat, Grandpa. Only bigots and incompetents purposely takes things out of context, I’m assuming you are neither, thus this is very humorous. I think you’re underthinking this one. This isn’t a document about hate or discrimination about gays or women, it’s just an outline of Mormon beliefs. It hardly describes women roles in detail–it just says that they are responsible for the nurturing of their children, a responsibility that most mothers, if you ask them, gladly take on. It doesn’t say women are to be automatons, or that men should tell them what to do, or that men are solely responsible for all family decisions. It says, in essence, than men should man-up and get a job to support their families so mothers can do what they need to do to raise good kids. Also, since you’re taking the time to go through every line so deliberately, I think it you go through it again with the same exactness, you’ll find that the Proclamation is far more than what you think it is. It is, in essence, a complete outline of the doctrines of The Church of Jesus Christ. Even Heavenly Mother is in there, which is a can of worms that hasn’t been opened for decades. They even describe the entire Plan of Salvation in one sentence. If you ask me, that’s one hell of a sentence. I’m not here to make a stand. You obviously have strong opinions about this that aren’t changing any time soon. I’m just saying that in your “research” in regards to this document, you’ve missed a couple of things. I am grateful that if there is a religious organization that teaches the importance of families and gender, I would really support them no matter what their beliefs are, because today, many people believe in family relationships, yet the family relationships are under attack, by those who hold higher offices of power. so at least some are standing up for families. You seem to know a lot about us Mormon’s if you ask me instead of twisting what you know or learn you should remember it and ponder it. Did you use to be a Mormon? Way to take a church document and remove everything religious. Kinda pointless if you ask me. its like removing everything historical from a history book. there’s no real reason, and you prove nothing. But hey its your prerogative. I wish I still had one so I could do the same thing to it. My mom gave us one many years ago for Xmas. It has never graced our walls. I finally threw it away. I have also asked that she take my picture down since I don’t believe in what it says. I could very well have my picture on this version. Well done. Why don’t you go build something of your own instead of tearing down the efforts of others? You have issues and are obviously an insecure person. Any woman who would stay with someone so disrespectful to her own parents deserves a child like you I guess. It was a gift, and no matter how much it costs, it means something to him or he wouldn’t have bothered. The whole meaning behind a “gift” has nothing to do with the price. Gifts are to show kindness to others. Good job being ungrateful, we need more people like you in the world. Better yet God can just destroy you when he’s good and ready. Good day sir. Misery loves company! If you don’t believe it that’s fine. We are not here to hurt anyone or offend. We believe what we do. Leave it at that. If you are going to BASH, maybe you should read the BOOK so you can make an informed opinion. That is, if you can read. Its on audio too. You obviously have no idea the contributions Mormons make to the world. We are there on scene for any disaster right with The Red Cross and W.H.A. We feed and clothe millions out of our own pockets, no one gets paid to be in this church.and we don’t want to. Why don’t you find something else to insult and defame. Like your birth certificate. May GOD have mercy on you’r proud ignorant soul. You have made yourself a mockery, and I will not support your website. You will pay for your sins as much as you think your reacted statement is meaningless, and you will see the judgement come down upon you. I think it is best that we encourage them not to do these things and not judge them but whatever you were taught, I respect one hundred percent. Everyone who is seriously involved in the pursuit of science becomes convinced that a spirit is manifest in the laws of the universe – A spirit vastly superior to that of man and one in the face of which we with our modest powers must feel humble. Albert Einstein. Our greatest scientists are convinced, and there have been many since Albert to concur. My own experience certainly attests to this same conclusion. Aside from this you have Pascal’s Wager which is reflected best, to my mind, in this statement – If what Our Heavenly Father promises you as a ward for your efforts, whether they be good or bad, then it would be really sad if you mistakenly decided to ignore the opportunity whilst if it isn’t true you would probably still be better off living the life anyway. I testify that he prepared all things for you and paid the ultimate sacrifice for you and that he lives and loves you . In the name of Jesus Christ. Amen. I wonder if this strategy has been ever been put in place while translating the Bible. The edited proclamation sounds like everything else we hear today. It sounds nice. It’s inoffensive and doesn’t call for anything to change. Nothing special. What makes the original so important is that it isn’t afraid to state what needs to be stated. When it first came out in 1995, a lot of people wondered why there was such a need for an official statement about family values. Now, with all the changes going on in society, we know. I appreciate your outlook. It has opened my eyes to how a lot of people view the world and to what parts of the proclamation really are important. Thanks for your comment. While most of the replies are often true in their meaning and understandable in their frustration, sometimes they don’t really reflect the way we REALLY feel about who we are. I’m not sure who this guy is and why he does what he does, but President Monson talked about seeing people as they may become rather than who they are. What we CAN do is take what we can. In the light of the spirit, I had a similar experience, seeing what the world sees. And you’re right. Clearly as a funny (offensive) joke he was making a point of his. And that point is what the world is trying to do. All the more reason to take a stand for what we do believe and stand for. Although telling someone they will be destroyed by God, calling them a dirtbag, and demeaning their very existence–while those feelings are understandable–is not the way I see Christ responding. This does not mean the church is not true or that we’re not Christian. Just that maybe we can work on our uplifting ways to respond and invite the spirit. Otherwise we are simply involved in fruitless bashing. A non-religious person can have other peoples’ beliefs crammed down their throats (a probable feeling the author had when given this proclamation), but heaven forbid that a God this person doesn’t believe in be taken out of the equation. Did anyone even bother to read the author’s version of this proclamation? It ends up being, in essence, a FAMILY PROCLAMATION that is relevant to another person’s beliefs. The disposition of this article is certainly cynical, and the edited version is more than likely a joke, but I would like to point out that a “gift” given to another person that bolsters their own beliefs while undermining the recipient’s seems less like a “gift” and more like an irritating stance. Many atheists have such a cynical attitude toward religious people because no matter how much an atheist may respect their beliefs (while not agreeing or even understanding them), you will be hard pressed to find a religious person who will show the same courtesy. So if a religious person doesn’t like their literature to be “disrespected”, maybe they should stop disrespecting other peoples’ beliefs and stop trying to force it upon a person who obviously knows what they believe in. I’m impressed. With the right editing, the Family Proclamation really is an inclusive, family-supporting document. I fully and whole-heartedly support this edition. 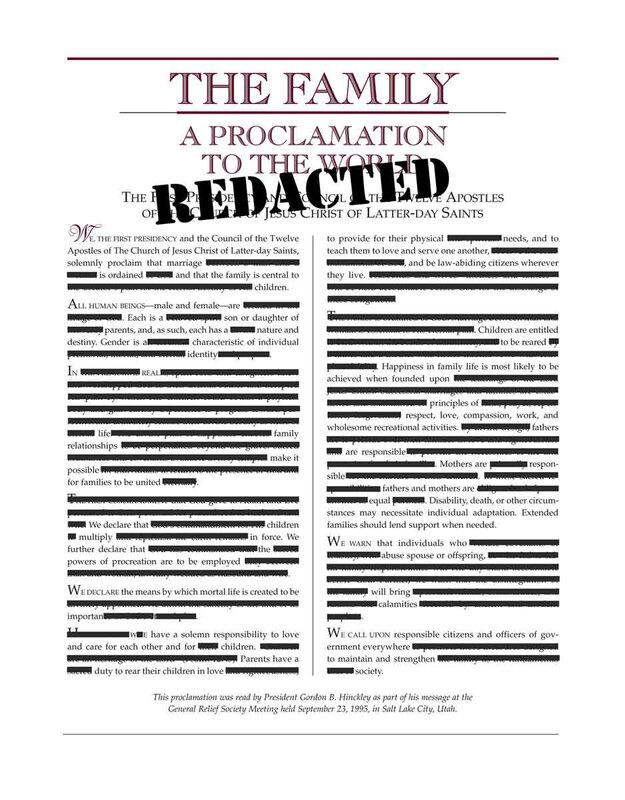 With the “right” editing, the Family Proclamation actually says nothing at all. @ Kat. I thought that as a good Christian you are not supposed to judge. I did agree with what you were saying until you had to throw the part about “God will destroy you when he is good and ready”. Let me just ask you this “Who the hell do you think you are?”. Little bigots like you is part of the reason why I turned atheist. Wow, people really have that much control over you? You allow “little bigots” to completely change your entire worldview on the eternities? Ugh. Not that it really matters, but I’d like to apologize for these other examples of Latter-Day Ain’t-dom. Seriously, people, if a document like the Family Proclamation or the scriptures teach anything, it is charity and kindness. I personally see the humor in this– and, truth be told, you’ve done what I usually do in my mind anyway: take out all the outdated and idiotic stuff. I guess that makes me a “Cafeteria Mormon” in that I’ll take all the good stuff and leave out the hate, but you could say that I’m following Jesus’s commandment to the Pharisee who paid his tithe of mint and cumin, but who Jesus told to obey the “weightier matters of the law”: like loving your neighbor. It always amazes (but never truly surprises me) the amount of vitriol and passive-agression I hear from LDS folks online towards people who disagree with them. You all need to learn to take a joke and to learn to be more kind. Dan, if you were shacking up with my daughter, I’d just be happy she found someone who treated her right and made her happy. I realize you posted this ages ago, but it still needs to be said. Atheists seriously spend a lot of time and mental thought rejecting and fighting against a God that to them doesn’t exist. It seems rather counter intuitive and pointless. If atheism makes you free, it doesn’t seem that way by your words. Thomas Jefferson took the four gospels in the New Testament and removed any references to the supernatural. What was left was a succinct bio of Jesus and his sayings. Thanks for this wonderful, inspired updated to The Family. This includes the belief not to believe in God. Although, I thoroughly do not agree with what you have done to The Family: A Proclamation to the World, and it is upsetting to me as I hold this document sacred. I know you are exercising your God-given agency to do so, and I won’t be unkind to you for defaming my beliefs. I would hope that you would one day find that Heavenly Father does exist and that you truly are His Spirit child, but again this is on you to find out as He is a gentleman and won’t force Himself upon you. Best of luck in all you do. May God be with you. And no, my last line wasn’t passive aggressive. I truly wish you the best in all you do, and I truly hope God will be with you to help you along this journey called life. Just wanted to clarify in case someone thinks I was being rude at the end, as I wasn’t and I hope it wasn’t taken that way. Wow. You must think you’re reeeeally clever. I love how even when you take out everything that could even remotely offend people, you still have a document that points people to greater happiness. Imagine what it could do if you were also willing to change. Who would do this? We don’t hate gay people! We just don’t support them! If you’re gay, good for you. Just don’t try making religious people feel bad. I had a friend who was gay. She was one of my best friends and even though she was very pro LGBT, she still accepted my beliefs and was still kind to me despite me not supporting homosexuality and being a Mormon. To all you gay people, I want to love you. I really do. But you make it so hard when you end up being just as cruel and judgemental towards the people you accused of doing the same. God doesn’t hate gay people. We are all his children and he loves all of us. Just because we have an opinion, doesn’t make us bad people. Stop saying “We’re gay so just accept it”. I’m a Mormon. So why can’t you just accept that?